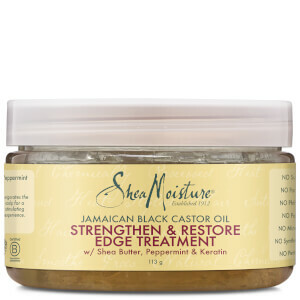 Nourish and control hair with the Jamaican Black Castor Oil Strengthen, Grow & Repair Edge Treatment from Shea Moisture. Utilising Peppermint, Jamaican Black Castor Oil and Organic Shea Butter, the nutrient-rich formula strengthens, conditions and promotes healthy hair growth, whilst providing light, touchable hold and humidity protection. Controls frizz and flyaways for super smooth, sleek locks that are easy to style. Ideal for natural, chemically-processed, colour-treated or heat-styled hair. Rub a small amount together in hands and apply to dry, styled hair, smoothing flyaways with fingertips. For maximum control apply small dabs to hairline, and to ends or damaged areas. Can also be used as a pre-styler on towel-dried hair. Glycerin (Vegetable), Water, Zea Mays (Corn) Bud/Seed Extract, Pectin, Ricinus Communis (Castor) Seed Oil, Butyrospermum Parkii (Shea) Butter*, Mentha Piperita (Peppermint) Leaf Extract, Aloe Barbadensis Leaf Juice, Hydrolyzed Keratin, Tocopherol, Macadamia Ternifolia Seed Oil, Panthenol, Vinegar, Cetrimonium Chloride, Agave Tequilana Stem Extract, Niacin, Potassium Sorbate, Mauritia Flexuosa Fruit Oil, Fragrance (Essential Oil Blend), Yeast Extract, Citric Acid. *Certified Organic Ingredient.